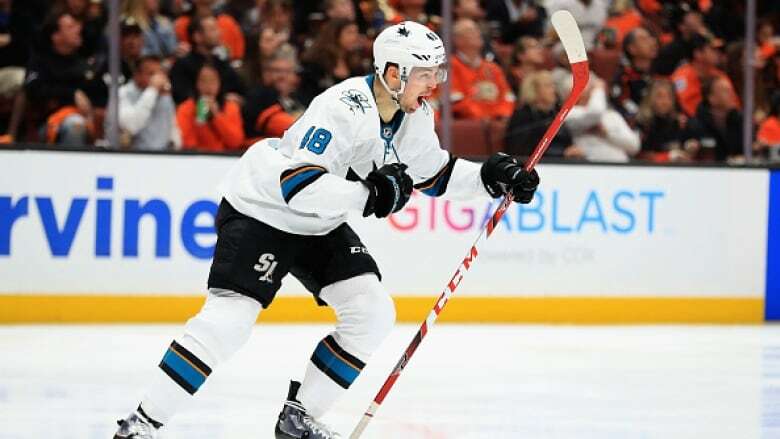 Logan Couture had a goal and an assist, Martin Jones made 28 saves and the San Jose Sharks excelled on the road again, beating the Anaheim Ducks 3-2 Saturday night to take a 2-0 lead in their first-round playoff series. The Anaheim Ducks showed their embarrassment from their playoff-opening shutout loss with every bone-crunching hit they landed on the San Jose Sharks throughout Game 2. They're not leaving Orange County without bruises, however; the Ducks attempted to make up for their listlessness in Game 1 with a series of big hits early in the rematch. Nick Ritchie, Hampus Lindholm and Francois Beauchemin all delivered early on, with Lindholm sending Game 1 hero Evander Kane to the bench with a mouth injury from an open-ice shoulder check. Game 3 is Monday night at the Shark Tank — the SAP Centre — in northern California. Lindholm had a goal and an assist for the Ducks, who are leaving Honda Centre with an 0-2 series deficit for the third time in their last five playoff series. Jakob Silfverberg scored in the opening minute and John Gibson stopped 32 shots as Anaheim dropped to 3-6 in its last nine home playoff games overall. Anaheim undeniably showed more resolve and creativity than in its series-opening defeat, but its scorers still couldn't crack Jones and the San Jose defence when it counted. The Sharks' late-season slump hasn't hurt their ability to rise in the post-season, while the Ducks have retained little momentum from their ferocious second-half surge in the regular season. But after getting shut out two days earlier, the Ducks scored on their first shot of Game 2. Just 40 seconds in, Silfverberg flung a long shot past a few defenders and got his 18th career post-season goal past Jones, who didn't appear to read it well. Honda Centre grumbled when Hertl put the Sharks up 3-1 early in the second, and the Ducks finally responded with their first sustained stretch of control. Lindholm trimmed the deficit with a nasty wrist shot during a power play, and Perry barely missed tying it up moments later with his shot off the post. "We have some strong shifts, then we take a couple off," Ducks defenceman Brandon Montour said. "We have some lapses, and they capitalized on those."